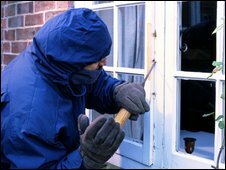 Homeowners in parts of Nottingham and London are among the UK's most likely to file burglary claims, a study says. Five of the top 20 postcode areas where people have made home insurance claims for burglary in the past five years are in London, says Moneysupermarket. Four were in Nottingham. These included NG5 - Arnold - which was identified as the worst-hit area through analysis of 2.6m claims by the comparison website. Parts of Ellesmere Port, Cheshire, and Roundhay in Leeds also proved hotspots. Areas of Leicester, Sheffield, Croydon in Surrey, and Hove in Sussex, also made it into the top 10 districts in which burglaries were most likely to occur. Some 0.42% of people from Arnold who asked for quotes via the website said they had been burgled in the past five years, while that rate was above 0.24% in the rest of the top 20. Julie Owens, the site's head of home insurance, said: "Along with many other UK cities, London and Nottingham are classed as high-risk areas for crime and it is no surprise to see these areas dominating the top 20." But she added: "No matter where you live, there is always a risk you could become a victim of theft or burglary." Crime figures released last month indicated a 1% rise in burglaries - the first increase for six years - although ministers claimed that rates had almost halved since 1997. Police figures showed there were 284,445 house break-ins in the 2008/9 financial year, equating to one victim every two minutes. Information obtained by the Conservatives revealed Manchester as the town where domestic burglary was most prevalent, with 35 reports per 1,000 homes. Nottingham, Reading, the London borough of Haringey and Leeds made up the rest of the top five, while rural Teesdale in County Durham fared best.